When Pepsi confirmed it would be making a smartphone eyebrows in the T3 office rose almost in unison, but it's actually happening and you could get it for just 10p. The Pepsi phone has hit Chinese crowdfunding site JD Finance with a goal of ￥3 million which needs to be raised before December 3 2015. 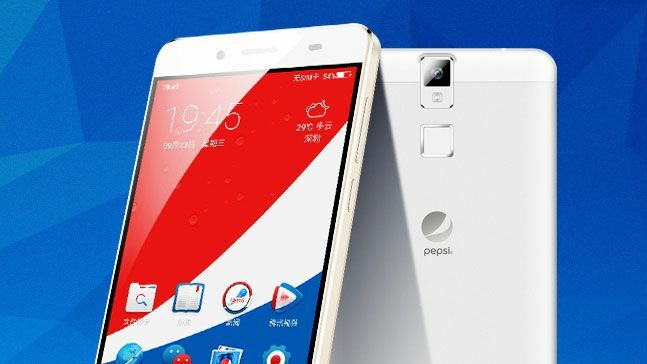 While you can guarantee yourself a Pepsi phone (if you live in China) by stumping up ￥699 (around £70) - although this perk tier is almost sold out - 500 lucky people will get the handset for just ￥1 - which is roughly 10p. That's less than a can of Pepsi! To be in with a chance of winning the Pepsi phone for 10p you have to be one of the 10,000 people who pledge ￥1, with the 500 winners randomly selected from that pool. The final price for the Pepsi phone, once all the perk tiers have sold out, is ￥1299, which works out at around £130. That's a very reasonable amount considering the Pepsi phone sports a 5.5-inch full HD display, 1.7GHz octa-core processor, 3000mAh battery and a fingerprint scanner. It's just a shame it's unlikely to ever make it out of China.